Rosalind Crisp is a Sydney dance practitioner whose Omeo Dance Studio has become an important and influential fixture in a city that lacks both physical space for contemporary dance practice as well as tangible networks and community support. She has recently returned from a trip to Belgium, France, Germany and America with her company stella b. where she made contacts that were both inspiring and beneficial. She returns there in May for at least 12 months, moving between Belgium, Paris and Berlin, and joined from time to time by her collaborators. Erin Brannigan talked to Crisp about travel and its challenges, her current practice and the future of the Omeo Dance Studio. First let’s discuss your recent trip. The idea for the trip started when I went to Glasgow for the new moves (new territories) dance festival in 2000. I went on to Belgium after that to visit some people I used to work with there in the early 90s. They were really interested in what I was doing and then a residency came through at the Monty Theatre in Antwerp. It’s quite a new studio above the theatre, curated as an international residency space. I received support for myself and my company, stella b. [currently Nalina Wait, Katy MacDonald and David Corbet] from Monty and from the Australia Council. So when I knew that arrangement was solid I built some other connections and what evolved was a 2 month tour with stella b. beginning with La Biennale du Val de Marne in Paris to showcase traffic, then back to the residency where we showed the results of the research we had done there. Then we returned to Paris and the Centre National de la Danse where we performed traffic and presented the Monty research in a forum. We went on to Berlin and did the same at Tanzfabrik and then I went on to London to do some teaching. Finally I went to the Improvisation Festival in New York then to LA to do a lecture/performance at the University of California, Riverside where dance theorist and practitioner Susan Leigh Foster is based. She invited Andrew Morrish and I to come over and she’s keen to have us back so maybe something else may develop there. It was just incredible—I didn’t expect anything but was kind of hoping people would be interested in the work and they were. So it was very exciting and we received lots of invitations. Venue producers from Paris who came to see some showings are interested in commissioning me to do new work and I managed to find a manager in Paris who is helping me to get that together. And a lot of things came out of it artistically—especially the residency. It was a fantastic time to be really focused, away from Omeo, board meetings and that sort of thing…I felt really challenged and inspired by the questions they were asking. So it was about getting exposure and stimulus. 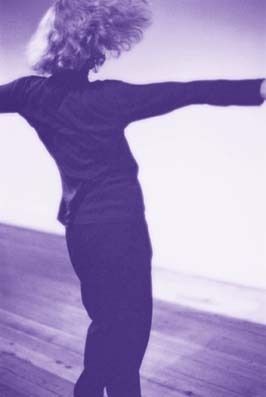 What kind of pre-conceptions do you think people had about you as an Australian contemporary dance practitioner? In Belgium I felt there was a great interest in where I was going personally and the type of inquiry I’m interested in. They’re kind of unorthodox in a way…not so held by ballet and what’s technically correct. There’s a lot of experimentation there and I felt very inspired by that. And in Paris some people said “We’ve seen this…we don’t think it’s new but your personality in the work is really different.” And I thought, “is that Australian or is it me or what?” They were very intrigued and France is where most of the offers have come from for next year. And then the response in Berlin was completely different again—I felt like they were overwhelmed by the work, as if they hadn’t seen any dance that wasn’t dance theatre. I didn’t feel the same critical engagement with the work. Perhaps the form I’m working with isn’t as familiar…Also, it seemed that there is a lot of interest in work that isn’t being promoted from the Australian end, and not a lot in the Australian work that is being promoted there. But I can’t profess to represent the European perspective. It’s really complex…I felt strongly that the critical dialogue is in Belgium and France and that’s what really attracted me—much more than in Berlin and America. In Brussels I met a couple of ex-students from P.A.R.T.S, the De Keersmaker school, and they’re very inquisitive—their feedback on the work-in-progress was just fantastic. They interrogated us in a genuinely interested and respectful way and were armed with so many tools. There’s a limited audience here and you’ve been addressing it for some time. Does it feel like time to take your work to new audiences? It seems quite hard for me to grow here anymore at the moment. I don’t feel that I can get the exposure and the dialogue that I need to challenge me…And the gigs—there’s just not the work here. And that does something else, having a lot of performances. Katy and Nalina grew in leaps and bounds while we were away. It takes a year over there to get the equivalent of 10 years here, so it speeds up the process. I don’t feel negative about Australia. It’s just what’s right at the right time. Being isolated has been fantastic—it’s really allowed me to develop my own voice. However, there are differences between Australia and Europe that need to be addressed. The decentralisation of funding for dance in Europe means it’s possible to develop the connections that I have made and the networks of interest and support. This is unlike Australia where there is basically only one decision-making body, the Australia Council, deciding who gets to make dance each year. The European model is that funds are given to the venues to distribute. This encourages diversity and a sense that there will always be a place for your particular kind of work. The arbiters of taste who have the power to define what dance is in Australia are very few. And those few producers with money in Sydney, the Opera House Studio and the Sydney Festival define a very limited field through what they support. I do think this situation puts a stranglehold on the development of dance practices here. What have you been working at—as a solo artist and with your ensemble? What came up in Monty was that there was material that I needed to go further into—on my own body—before I could communicate those ideas to the other dancers. And that’s tended to be my process, working through physical ideas on my own, getting clearer in my own body and then communicating it to the others, then developing it further with them bouncing to and fro. I found at Monty that it felt premature to make work with them when I felt my body was shifting to another place from theirs, so I felt I needed to pull out for a while. It’s not that I’ve moved away from the ensemble work, it’s just that I’m doing a solo at the moment. I’ve seen my company stella b. as what I was doing, and in a way it still is. I’m working with the same composer and this solo will be performed with another group work. But I needed to make the shift from the training aspect for a while. Maybe that never goes away—perhaps I’ll find that I’ll always be in a situation where I need to train people. I’ve also been encouraged by some of the French producers to work with some European dancers and see what that does to the way that I’m working, and I find that invitation exciting. What is the history of the Omeo Dance Studio? I took on a studio in Annandale in 1994. That was a huge risk—I thought ‘my god, how am I going to find this rent?’ I got through 18 months there and cut my teeth, so it wasn’t such a huge leap to then take on the Newtown space. Omeo Dance Studio is an interesting phenomenon. It’s just evolved without me even noticing it. And I suppose my funding status was reasonably good. I took Omeo on when I knew I had a funded project that had a budget for studio hire. But the first 2 or 3 years were pretty hard and I used to ‘pray’ for money. I lived on nothing really until the Australia Council bestowed a fellowship on me. And then the studio became self-sufficient? Well I work at least 12 hours a week in there for it to run, so that’s my labour in exchange for the space. I don’t really want to be the administrator of a venue so I keep it as streamlined as I can. I incorporated it 18 months ago with Andrew Morrish and Silver Gabriel Budd, but it also means we’ve taken on more work because we can. And it’s not just the work on the phone; it’s listening to people, welcoming them and responding to their needs. I did enjoy that in a way because there were a lot of conversations…It does feel that it’s a distraction for me now. I came back from Europe and I realised I’d been like an outrigger ship, dragging all these people along with me—so much effort. But of course I’ve got a lot out of it. It is a business to the extent that it makes the money that it needs to run. It’s totally non-profit and nobody has been paid for the work that’s been done for the last 6 years. You could rent it out for high rates like other studios, but then it’s just a studio for hire and it doesn’t generate a community. I’ve made the decision to have a sliding scale so people with a ‘studio’ practice can use it for longer hours. So it’s all very tentacled around what I’ve done there. There is a vision—things I’ve decided to do and not to do, and having people contributing to the rent who are people I really want to support. So what’s going to happen with you being away for the next 12 months? I now feel I want to keep it going, partly because of the people who want to use it and partly because I actually want to come back and work there. It’s also a structure for me to continue working within, to be able to reconnect with a part of what nourishes me. And I do see things occurring between here and Europe. I don’t feel like I’m going and that that’s the end of it. I’m still not sure how that will happen but the amazing thing is that Carol Dilley just turned up and I asked her whether she would be interested in managing Omeo and she said she was. She has run a company in Barcelona and she is organised and mature and smart and wants to get to know the dance scene in Sydney…And she wants to keep the studio going and she respects its history, which is great. And it’s also perfect because it’s not exactly a financial concern, but it seems there’s something for her to gain from it. It needs that reason to keep going…so that’s what has happened. So it will still be Omeo Dance Studio.